The Oxford School of Upholstery is a registered training centre for the Association of Master Upholsterers and Soft Furnishers (AMUSF). This programme is designed for students who wish to receive a certificate accredited by a industry recognised body, the AMUSF. The certificate will enhance your employability and give you the skills required to embark on a successful career in upholstery. We’ve been delivering the AMUSF accredited-course for over a decade, and we’re pleased to say that we have a 100% pass rate, with the majority of students receiving a merit or distinction grade. The AMUSF qualification course is broken down into three seven-week courses. Each stage is a qualification in its own right and certificated separately. Successful completion of all three courses results in the AMUSF accredited diploma. Students will follow an assessed syllabus of work, which has been designed to reflect the market demands of this creative industry. You will also be expected to do some written work as part of the course. On successful completion of the first stage of your diploma, you will have gained a good understanding of the techniques and materials used in modern and traditional upholstery. You will have also completed practical projects and a written project. To find out more about the Stage 1 syllabus, download our PDF here. During the Stage 2 Certificate you will develop strong practical skills in upholstery and begin to work towards more complex projects. You will have also completed practical projects and a written project. To find out more about the Stage 2 syllabus, download our PDF here. On successful completion of this course, you will receive your AMUSF accredited Diploma. You will be ready to work on client briefs and commissions, and have the skills and confidence to embark on a career in upholstery. You will have also completed practical projects and a written project. To find out more about the Stage 3 syllabus, download our PDF here. We offer a flexible approach to the courses, so students can attend for the full seven weeks or break it up into weekly or fortnightly chunks over a twelve-month period. We run the courses throughout the year on a week-by-week basis. The cost of the accredited courses is £385 per week plus materials. There is also a registration fee of £60. 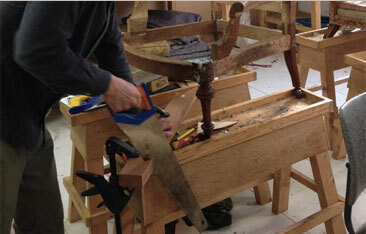 Students bring their own upholstery projects as set by the syllabus or if required we can help with sourcing furniture. 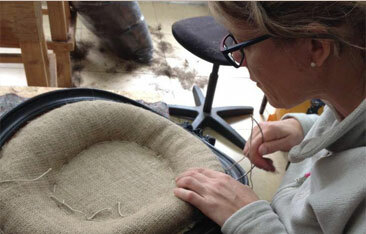 The Oxford School of Upholstery also offers their own independent diploma programme for students wishing to pursue upholstery as a business or career. To find out more, just click here.